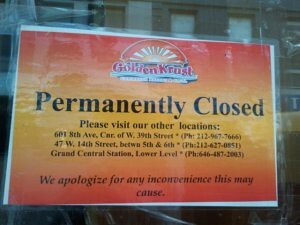 Sad news on the Caribbean chain restaurant front: The last location of Golden Krust below 14th St. has closed. When I walked past the former purveyor of meat patties and cheap lunches on Nassau St. (btw. John & Fulton), the sign above was hanging in the window informing us that the nearest remaining locations are either in midtown or near Union Square. You may remember the Tribeca location on Church St. quietly closed a year ago. Thankfully we still have non-chain sources of Caribbean food at Veronica’s Kitchen, R. Retha’s and the Trinidad & Tobago carts. Posted by Andrea H at 9:00 am, February 24th, 2012 under Closed, Golden Krust.